No more resumes. Bring your experience and personality to life through short videos and find your dream job. Video applications show your enthusiasm for a job more than a resume ever can. And companies love them because you are answering their questions about the role. It’s time consuming going on lots of first interviews. 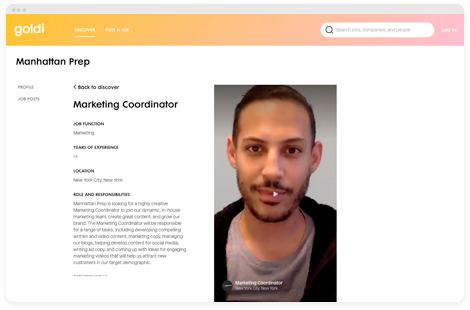 goldi speeds up the interview process and has you meeting Hiring Managers at companies, faster. Don’t wait until the first interview to find out if the company is the right fit. Watch video job descriptions created by the company describing the role and what they are looking for. Start by creating your profile video.Let companies see the real you and bring your experience to life througha video profile. Find out about a company’s culture andtheir open roles by watching their videoposts. Get a sense of the team andwhat it’s like to work there beforeapplying for the role. Found a fit? Apply by creatinga video application answering3 questions about your experienceas it relates to the role. If the company is interested, they will reach out to start the interview process. Land your dream job! Have a question? Need technical support?